•A metal housings that is incorporated into the base of your denture. •A rubber O-ring, housed in the metal housings, to provide the seal that locks the pieces into place. 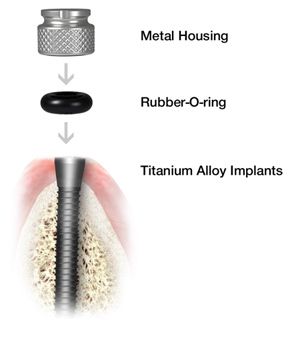 •Mini titanium alloy dental implants, rooted into the jawbone, that act as an anchor to stabilize a lower denture. The mini dental implant procedure takes place in Virginia Beach dental office, with local anesthesia. Typically, the procedure takes only one appointment and can be completed within 2-hours! Dr. Dooley uses a precise and controlled technique to insert the small diameter implants (around 2 millimeters wide) into your jawbone. •With heads that are shaped like a ball, the implants protrude from the gum tissue where they will provide a secure anchor for your dentures. •Metal housings that carry a rubber O-ring will be inserted into the bottom of your dentures. •When your dentist seats the dentures on the mini dental implants, the O-ring snaps over the ball like a socket and locks the dentures firmly into place as they gently rest on the gum tissue. Because of the minimally invasive nature of the mini dental implant procedure, the MDI placement won’t require you to go through a lengthy healing period. Within a few days, you’ll be out and about, enjoying a lunch of your favorite foods, talking with ease, laughing and smiling freely. All that time, you’re feeling a new stability in your dentures—secure that they have the staying power you need without messy denture adhesives or creams. Please contact our Virginia Beach cosmetic dental office with any questions or to schedule your appointment for Mini Dental Implants.